We were slightly less impressed with this product than we might have been since its advent comes so closely on the heels of another festive confectionalized corn concoction: last month's Candy Corn Popcorn. If your birthday happens to be in October, then this product is arguably seasonally-appropriate, but for the other eleven twelfths of us, the candy corn variety is a little more Halloweenish and, therefore, Octoberish. 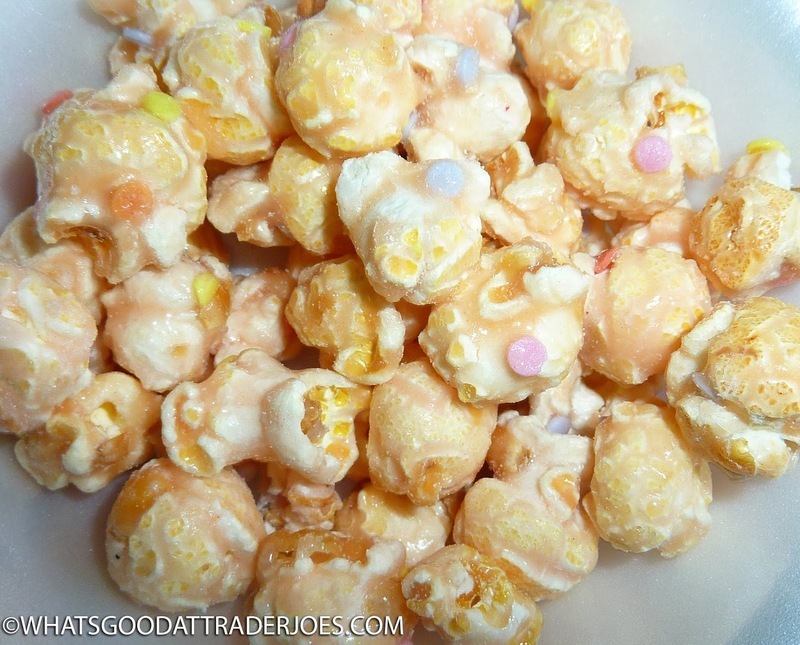 Taste and texture-wise, this candied popcorn is remarkably similar to the candy corn version. It's still a high-quality popcorn coated in a slightly waxy, sugary glaze—sweet and a little salty, addictive, and hard to put down. It also begs comparison to Trader Joe's Birthday Cake Bar by virtue of its nearly identical packaging and presentation. Like the bar, this product boasts colorful little sprinkles. There's approximately one sprinkle per corn kernel, on average. Oddly enough, though, I felt as though I could taste them, but it could be just the power of suggestion. I know for sure I could feel them—firm, round little funfetti do-dads in nearly every bite. As far as the coating is concerned, it's not really white chocolate like I was hoping for. 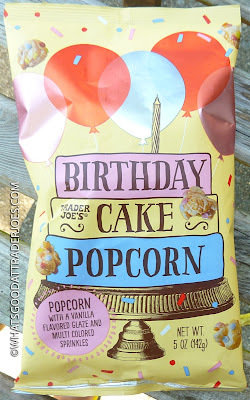 The Birthday Cake Bar was most definitely made of delicious white chocolate, so I reasoned that TJ's would glaze this popcorn with the same. It's really just sugar, tapioca nonsense, and...well, you can read the ingredients list as well as I can. No mention of cocoa butter or anything milk-related, so...not white chocolate in my book. And yet, it's got a similar vanilla-esque essence. It tastes very faintly of actual birthday cake somehow. In a blind taste test, I could most definitely differentiate this product from the candy corn popcorn, but the sprinkles/jimmies are the most obvious difference. It's not a bad snack by any means. 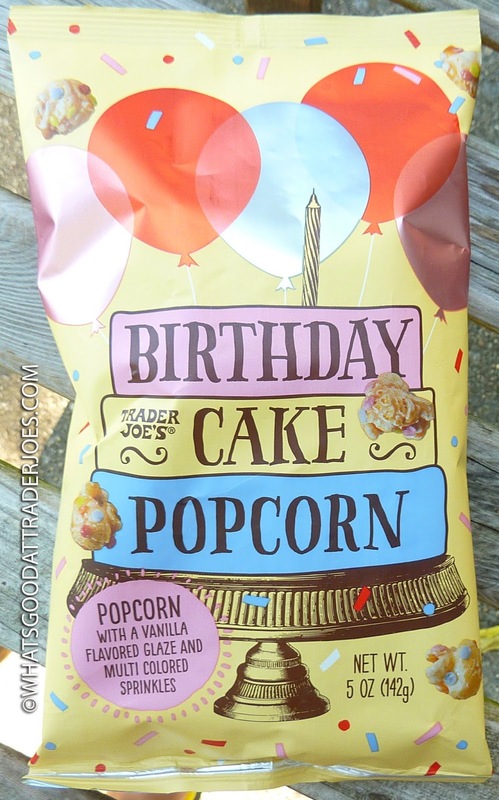 It would be perfect for parties—birthday or otherwise—although the bag would be gone in a matter of minutes. Again, Trader Joe's tells us there are five servings in the bag, but most people are gonna go with two or less. I'm a little sad there's no white chocolate, but I can't complain much other than that. Three and a half stars from me. Sonia enjoyed this just about exactly as much as she enjoyed the candy corn popcorn, so four again from her. These would be fun for a kids birthday party because the sprinkles gives it a fun pop! Also I think it will be a great mix in for ice cream too! How funny that TJ's sells sprinkles with their other products such as cookie kits and confections but haven't yet sold by themselves. Would be nice! Ice cream topping/mix-in is a great idea for this. Happy birthday, T...er I guess I should be saying "happy birthmonth!"